Every single person I know who loves to bike to work or for fun uses Strava to track their route. I'm sure there are people who track their runs in Strava too, but I haven't met any of them. I don't know what it is about this app and cyclists specifically, but it seems that Strava has found a way to appeal to them and make the experience of cycling both challenging and social. Part of it are the Clubs, a feature that lets runners and cyclists form groups, compete with each other, share routes, manage events, discuss their progress, and more. 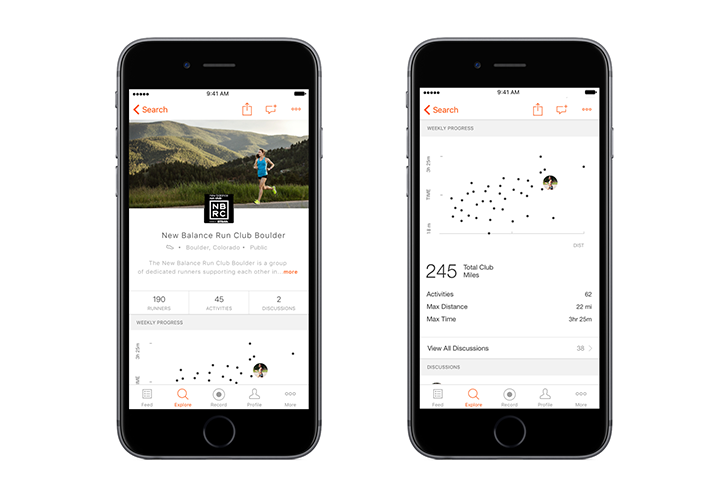 There are over 130,000 active Strava Clubs and until today, the only way to access them was through the online site. Now Clubs are coming to mobile and they should be live in an update to the iOS and Android apps soon. (Forgive the iPhone screenshot, Strava didn't provide any Android screens. Gah.) Once the feature is live, you'll be able to search for nearby Clubs, see their engagement level (number of users, activities, discussions), and filter them by type of sport. You can then join a club (or start a new one), start discussions or comment on others' posts, and check the weekly leaderboards with a cool new scatterboard that lets you easily see how well you're doing compared to your club mates. Club admins can also create and manage events with date, location, route, pace, and so on, but that feature is still only accessible on the web. It will come to iOS and Android later in 2016. For now, members can view events in the Club's discussion timeline.